Folding Handle Electric Heavy Duty Stair Climber Hand Truck - Wesco 274101 is best for copiers, safes, heavy motors or any short and heavy load which would require the user to pull the load back to a very low position. The adjustable angle position on the Fold model allows the user to stand upright when using the truck at a very low angle. Brake can be shut off for use on level ground - prevents unwanted braking when moving over ground with an uneven surface. This model of the Liftkar is similar to the other powered heavy duty stair climber hand truck with the exception of that this model has a folding handle making it ideal for Compact, heavy loads. The patented, infinitely adjustable friction clamping system lets you adjust the handle unit to set the ideal centre of gravity. In addition this feature enables you to reduce stowage height of unit by completely folding the handlebar unit downwards. 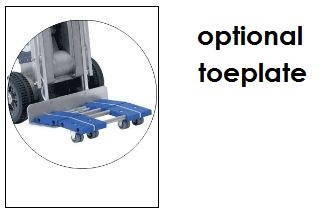 The optional toeplase is equipped with 4 dual casters. Provides additional cargo space and the ability to move loads without tilting truck. Especially useful in confined areas. Two operating modes: single step (ascend or descend button must be pressed after each step – ideal for maximum control), or continuous climb. Foam filled puncture proof tires – ideal for use on smooth or rough surfaces such as gravel or cobblestones. High-strength extruded aluminum nose plate - 21" w x 7.2" d.